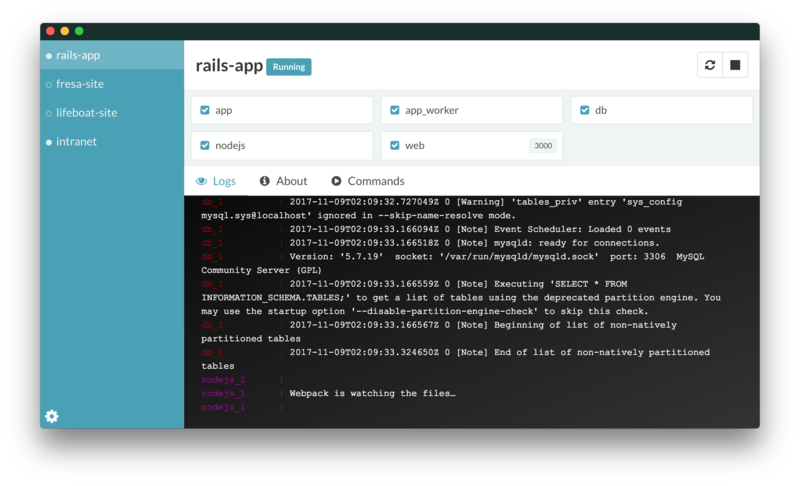 A Docker UI for projects. Download for Mac, Windows and Linux from the Releases tab. This is an Electron app, scaffolded with electron-vue. You will need to have Node/Yarn installed locally. You will need to have Docker for Mac or Docker for Windows installed and running. Older implementations of Docker, using docker-machine or boot2docker, are not supported. You will need a test project with a valid docker-compose.yml file. Consider using one of the example Docker Compose projects to test. Vue Test Utils: The library of tool used to test shallow copies of Vue components. Expect: Part of Facebook&apos;s Jest testing suite. Used for assertions. Sinon: Used for spies, mocks, stubs, and fake timers. This project was generated with electron-vue@331f85f using vue-cli. Documentation about the original structure can be found here.